This photograph was taken by my dear friend Mary Spain on a recent trip to Richmond Park near London, England. 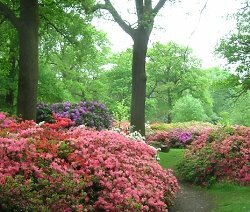 It is of azaleas blooming within the Isabella Plantation there. She sent me the photograph in order to share the magnificent and stunning variety of colours and kindly agreed to letting me share it with our Medieval Castle Blog readers. So here it is! You might ask: where’s the medieval connection? Well, having lived in London a number of years myself, I too had Richmond Park on my itinerary for the occasional trip out of the city ‘smog’. It was always a wonderfully pleasant place to go and get away for a few hours. So I know a little about its history. Although there is no castle within Richmond Park itself, the land does have royal connections dating back to the 13th century when it was known as the Manor of Sheen. Indeed, Richmond Park is the largest "Royal Park" in London and covers 2,500 acres. Read more about the the history of Richmond Park and the Isabella Plantation.